Costa Rica conjures images of lush tropical rainforest, volcanoes, and miles of coastal beaches. More than most places, the country even lives up to that idyllic image. Costa Rica is firmly on the tourist radar and visitors come every corner of the world. The bulk of these visitors head straight to one of two pursuits, ecotourism or adventure sports. And by all accounts, these are both activities in which the country excels. All of this is important for expats thinking of moving to the country because tourism is the largest driver of the Costa Rican economy. No matter where you move, you’ll feel the effects of this tourism. That said, there are certainly cities and towns outside of the tourism radar — we’ll take a close look at those too. All things considered, Costa Rica strikes a balance that is hard to find in other expat locations around the world. Although neighboring Panama also has a large expat community, both countries have very different cultures. I’ve lived in many places over the years, and my time in Costa Rica felt more Western than many other spots. There’s a comfortable familiarity to life in Costa Rica. And like all Central America expat spots, for Americans there is an added incentive that it’s on the U.S. time zones and flights are very reasonable. But there’s more than that attracting families, expats, and retirees. Throughout this post, we’ll explore the quality of life and cost of living in Costa Rica’s most popular expat spots. At every stage, I’ve included ample additional resources for research. 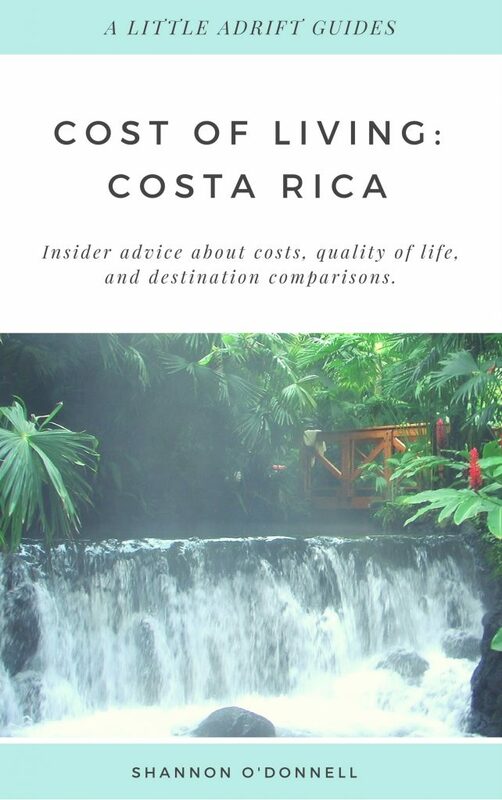 Let’s take a closer look at what it’s like in Costa Rica, the quality of life, and the cost of living. Ask a Costa Rican expat what they love best about their life and you’ll receive answers as varied as the country’s topography. There’s a lot to love about this spot in Central America. First off, it’s in Central America, and that means it has all the flavor and fun of living in Latin America. Costa Ricans live up to this, with a welcoming and inclusive culture — in many towns, the expats fold right into the fabric of everyday life. Let’s talk nature. The country boasts an incredibly diverse set of climates. You could choose to live in a lush, temperate rainforest, or head to the beaches for a hammock and the slow life. Any way you slice it, expats living in Costa Rica have big love for the country’s exquisite nature. And it’s present at every level; Costa Rica leads the world on responsible tourism. In short, it’s a country lacking many of the inherent systemic issues you’ll find some other central American spots (like nearby Nicaragua). But you’ll pay for that difference. The National Parks are well-cared for by government and locals alike. The major roads are well maintained with the influx of tourism dollars. And the medical tourism industry thrives, which allows expats to also access world-class healthcare that rivals many developed nations. And while there are pockets of crime, Costa Rica is one of the safest spots in Central America. Many families also look to Costa Rica for their education system. In 1948, the government abolished the military and began to funnel that money into education. That gamble paid off. Decades later, the country has a very high literacy rate and good public schools. Internet: Internet is good in major city centres like San José, but can be spotty and with slower speeds in other parts of the country. Internet outages can occur. Average Local Salary: A middle-class salary in Costa Rica averages USD $750. In smaller cities, a monthly income is roughly $450. These fluctuate by region/city. Pet Friendliness: Costa Rica is relatively pet-friendly, however, the process for bringing your pets can be a little overwhelming. Start well before your planned move so you can have the vaccinations and documentation in place. Water: Tap water throughout the majority of Costa Rica is completely safe. In the port cities of Limón and Puntarenas, however, you should only drink bottled water. Visas: To enter Costa Rica you must present a valid passport, as well as proof of a round-trip ticket or an onward ticket. While they may not always ask to see this, it is a good idea to have it. Typically, you can stay up to 90 days without a visa, and there is a departure tax of $25 USD as well. For more detailed information, visit the US State Department website. Child Friendliness: I know of several families who have relocated to Costa Rica, they often settle in San José and Tamarindo. And while Costa Rica has very good public schools, most larger cities have at least one International/American school. International schools here often charge steep fees however, so let those fees help guide your research if you’re interested in private versus public school. Safety: Costa Rica is relatively safe. Pickpockets and muggings are common in city centres like San José. Always ask locals before swimming in fresh water as some contain microorganisms that can make you very sick. The currents along the Pacific and Atlantic shores are often very strong and dangerous, always read signs before entering the water to make sure you are in a safe area. Possible Issues: Water and power outages are common outside of major cities. Also, you must have proof of a return ticket before you board a plane to Costa Rica. Costa Rica is a relatively small country; once you land in San José, you can get to just about anywhere in one to six hours. Each region offers a different cost and quality of living, research and read local expat stories before you arrive. One of the nice things about Costa Rica is that it is a relatively small country, which means that once you land in San José, you can get to just about anywhere in 1-6 hours. Costa Rica is divided into five regions: Central Valley, Gold Coast, Arenal, Southern Zone, and Central Pacific. Each region offers a different cost and quality of life. It is a good idea to learn about the regions before narrowing your potential list of relocation spots. On the up side, there is a heck of a lot of local expats blogging about their life. This is like nuggets of gold for understanding what type of life you might actually have when you arrive. Your research should definitely include this type of information too, so you’ll find links to local bloggers throughout this Cost of Living Guide. A high-altitude plateau surrounded by mountains, the Central Valley is home the Costa Rican capital city, San José. There are several expat communities in the Central Valley, not just in San José, but in smaller towns like Grecia. The main draw for expats is the weather; this area of Costa Rica doesn’t get too cold or too hot. Plus, by living in the Central Valley, you’re close to major infrastructures; San José is only an hour drive. In the Central Valley, consider basing yourself in San José or Grecia. Living in or near San José also means you have the perks of nicer restaurants, museums, art festivals, expat import stores, and everything that comes with big city life. There’s little to sacrifice of your old life if you move to San José or adjacent. Jazz clubs, state of the art medical facilities, trendy coffee shops — they’re all available and the suburbs defy the rest of the capital — little congestion and chaos. It’s a good compromise if you’re a city person looking to escape the U.S. The capital of Costa Rica, San José, is located in the Central Valley at about 3,000 feet. The majority of the population lives outside the city centre, expats live in suburban communities like Escazú, a 10-minute drive from downtown San José with gorgeous views over the city. Escazú is pretty great — it’s a big city suburb that feels like a small town. There is a good mix of ages, so retirees will feel at home, as will digital nomads looking for coffee shops and jazz clubs. Outside of the city, Grecia is located about 27 miles from San José and is a popular destination with retirees who report that the cost of living is about 25% cheaper than in Tamarindo on the Gold Coast. Grecia is a mountain town known as one of the more affordable communities in Costa Rica. Located about five hours from San José, near the Nicaraguan border, the Gold Coast is a popular spot among expats who love to surf or lounge on a beach and enjoy beautiful sunsets. The vibe in the Gold Coast is made up of Tico culture and traditions and expats from around the world. The most popular expat communities in the Gold Coast are Tamarindo and Playas del Coco — also known as simply, Coco. Life here is lived in golf carts or in flip-flops as you walk the sandy beaches. Tamarindo is a community popular with both expats and tourists, the cost of living there is about 25% more than the small mountain town of Grecia. The community is a mix of surfers, families, retirees, and locals. Life is laidback, so much so that walking around in barefoot is perfectly respectable. Tamarindo has a good number of expat amenities and the life style ranges wildly from budget bungalow houses to beautiful condos. The cost of living here is a bit more than some other places in Costa Rica, but there are a lot of Western amenities and options, too. Located in northwestern Costa Rica, near the border with Nicaragua, Playas del Coco — which is more commonly called Coco — is a beach town, popular with both expats and Costa Ricans. The expat community in Coco is generally older retirees, however, there are some younger expats running around. While Spanish is helpful, you do not need to speak Spanish in Coco as many of the locals speak English — due, in part, to the tourist nature of the town. It has the vibe of a classic touristy beach town, but it’s not overrun either. There are more lively places, however, if you’re a younger expat or digital nomad looking for more to do (take a look at Uvita). Arenal is in one of the country’s more touristy regions in Costa Rica, thanks to 5,479 ft volcano which last erupted in 2010. While La Fortuna de San Carlos is the most well-known destination in Arenal, the high number of tourists tend to repel expats. Most expats living in the Arenal region live along Lake Arenal, where life is rural and generally quiet. Located about three hours from San José, Lake Arenal is a popular hub for expats looking for a quieter rural life. The lake is beautiful and relatively untouched by tourists. Nuevo Arenal, on the north shore, has most amenities making it a go-to for expats on their weekly shopping trips. You’ll have few big city amenities here, and life revolves around all that beautiful nature: hikes, time on the lake, quiet time in a hammock. The Southern Zone region is known as being more old school Costa Rica, with beaches and lush jungles, toucans, howler monkeys, and sloths. The journey from San José is about three hours, and the region is generally more popular with Costa Ricans and expats, than tourists. While there are several expat communities in the Southern Zone, Uvita is a favourite due to its music festival scene and gorgeous landscapes. This small village in the Southern Zone is a hub where many expats set up a home base. Life here is laid back, with music festivals, good food, and plenty of outdoor activities to keep you entertained. There is also a good bilingual school, plenty of restaurant variety, and it’s gorgeous. It’s the sort of town that’s large enough to have everything you need, but small enough that you know most of the residents, expats and locals alike. The national dish of Costa Rica is Gallo Pinto, a dish consisting of rice and beans that have been stir-fried together. Gallo Pinto is generally served at breakfast along with eggs or cheese. Ceviche and Olla de carne are also popular. Street food in Costa Rica is typically empanadas or pastelilo, perfect little snacks for less than $2. Most locals, when not eating a home, will eat at sodas. A soda is not a beverage, but a Costa Rican diner. Similar to Panama, the are not many vegetarian-specific restaurants in Costa Rica. That being said, traditional Costa Rican cuisine consists of locally grown fruits and vegetables, making it easy to find vegetarian dishes to enjoy. If you are celiac, eating gluten-free is possible in Costa Rica, as some restaurants will offer gluten-free options, thanks, in part, to the expats. There is a blog called Gluten-Free Tamarindo which features tips for restaurants and shops, as well as recipes, and includes a gluten-free restaurant card as well. What Does it Cost to Live in Costa Rica? Costa Rica offers a pretty good value for quality of life. There are definitely cheaper places to live. You won’t find rock-bottom prices, but Costa Rica has that je ne sais quoi that many expats simply can never quite describe. On my visits, I wowed at the nature. It’s remarkable how well preserved Costa Rica has kept their forests and beaches. Nearby Nicaragua is cheaper, Panama has the legacy U.S. influence, but Costa Rica has a quality of life that many feel offsets the slightly higher baseline costs. As a premier eco-friendly tourist destination, you’ll find that the touristy towns can have steeply higher costs than some of the smaller local towns. That said, even the smaller towns have a strong expat community. For expats, Costa Rica is firmly on the radar. The price ranges wildly differ, and that’s because there is a strong higher-end retirement industry here. You can live like a local for far less than some of these expats shared below. The average local salary is about $750, so that is usually the absolute lowest you could expect, but $1,000 is a better super-budget baseline for foreigners. This post provides a good comparison between cost of living in Florida vs Costa Rica. Because of the higher end options, the cost of living estimations within the expat community have a huge range, more than some places. Just as Thailand is the top expat spot in Southeast Asia, Costa Rica leads the pack for Central America (and excluding Mexico, which has more expats and is technically part of North America). Let’s take a closer look at how much it will cost to move to a few key spots in Costa Rica. Jason Holland is the editor of International Living’s Costa Rica website. An expat from the US, Jason has written an informative post about the benefits of living in San José. San José can have a surprisingly rural feel in some of the suburbs (think roosters crowing and cows grazing). Jason lives in Escazú, which is a popular expat suburb that counters the rumours that the capital is only filled with traffic, congestion, and chaos. This suburb is solidly mid-range and has everything an expat might want. Jason’s budget includes state of the art hospitals when needed, import grocery stores, health clubs, and jazz clubs. It’s a classic big-city life but at surprisingly low prices. Though there are incredibly high-end suburbs (Bello Horizonte), a two-bedroom local-style apartment in San José runs $450 per month, and a nicer one would run about $875. Those are some surprisingly low starting costs for a trendy neighborhood accessible to a solid quality of life. Greg Seymour and his wife, Jen, are expats from Dallas, Texas who quit their jobs and moved to Costa Rica in 2013. One important thing that they note is that they don’t live the same style of life that they lived back in Dallas. Their new life is much less expensive, but it also prioritizes different things. They downsized their house and rent a three-bedroom two-bathroom for $625/month. They hike and enjoy nature as their primary outings, with most nights out being at a friend’s house. Grecia is smaller, so there are fewer options than a big city like San José, but their style of life is also conservative, so keep that in mind if you hope to eat out more often than they tend to. A maid runs about $4/hour, and their budget includes maid service. Greg shared a detailed breakdown of their cost of living Grecia, and as a couple, he and his wife live on $1,500 a month. For a single person, that would mean you could enjoy life, and Grecia, on about $1000 baseline starting costs. Mike lives in the Southern Zone of Costa Rica and is on a higher budget than some of the others profiled here. Mike is living a slightly more posh life in his beach town, and he reports that he and his wife of a cost of living of $5,000 per month, although they budget for $6,000 a month. That’s not to say that his expenses are the norm for the Southern Zone, but rather let’s take a closer look at his budget and his quality of life. As noted, Costa Rica has a huge range of expats, and Mike shows that you can get a lot for your money if you have more too. Mike and his wife spend $1,500 a month for an ocean-view villa, and the bulk of the rest of their budget comes from expenses related to their cars, private health insurance, and extracurricular activities (like golf, tennis, and travel). Mike acknowledges that there are much cheaper rentals, and foregoing the two cars and A/C would lower costs. Nadine Hays Pisani is an expat living near Tamarindo with her husband, Rob. Nadine is the author of Happier Than A Billionaire, and has lived in both Grecia and Tamarindo. While not a typical cost of living post, Nadine shares helpful information about being an expat and tourist living in Costa Rica. She reports that rent ranges anywhere from $400 to $3,000 a month and shares a bit about how you can both save money and spend money as an expat. There are a range of grocery stores, and you will pay dearly for import items. She also echoes what is a common refrain — owning a private car and then buying gasoline is expensive. Living in cities with good public transport can make a huge difference in your baseline budget in Costa Rica. There’s a good community feel in Costa Rica that all expats report just loving. Sammi is an expat from America, who relocated to Coco to live with her Costa Rican boyfriend. 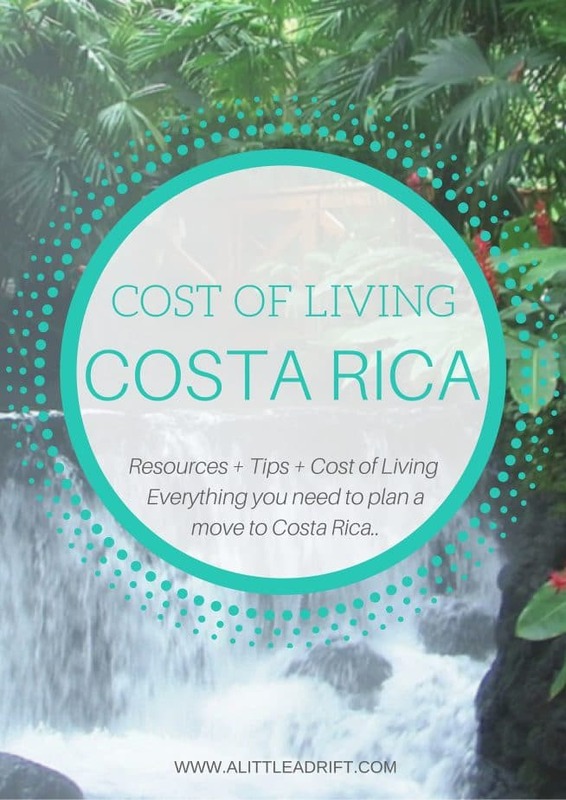 Sammi extensive cost of living in Costa Rica breakdown shares covers expenses, as well as tips on how to live in Costa Rica on a budget. Sami reports that, as a couple, their budget has never exceeded $2,000 a month. Their baseline rent in Coco is $400, and that covers a one-bedroom loft in a nice neighborhood, Las Palmas — she reports that $500 for a partially furnished place is a good expectation for Coco, though you can find cheaper options further out-of-town. For their monthly budget, their life is quite nice. They use moderate A/C, cook at home a lot but also spend $150/month eating out. And they have a car but work from home, so those expenses are low. Of possible beach towns, Coco has a laid-back pace of life that locals love. An expat from the U.S., Jason’s makes me want to pick up and move to Lake Arenal. His post shares great information and he reports that couples can live on $2,000 a month in Lake Arenal. The pace of life is rural and quiet, so you won’t have as many amenities as some cities. But the Volcan Arenal is nearby across the lake, and that brings in a fair number of tourists. For that reason, there is enough activity to keep things interesting, but prices remain surprisingly low. The Dennings are a family of eight who were living in Uvita. Roxy Denning detailed her family’s life in Costa Rica and shared the specifics of what it’s like to live there, how much it costs. According to Roxy, rental houses run from $500 to $1,500 per month for a family-size house. With rent, very baseline costs will come at about $900 for internet, rent, utilities, then stack food, transport, and activity costs on top of that. Uvita is an affordable town and there is also a good bilingual expat school in the town. Expats report a fair range of restaurants, art galleries, and enough options to keep life interesting. Paul and Gloria are baby boomers who moved to Costa Rica in 2009 and regularly share their monthly expenses, which come in at about $1,900 a month on average for 2018 and includes rent and food at ($500) each, and then various other expenses for utilities ($320), healthcare ($130). Their goal was to find a place where they could have a good life on less than $2,000 and they have found it! Their site is a bit hard to navigate, but if you look around you will find quarterly updates on their expenses through a range of blog posts and newsletter updates. Overall, living in Costa Rica is comparable to Mexico in food, culture, and costs. While it is possible to live on $1,000 per month in Costa Rica, you will enjoy life more by expanding your budget and allowing for extra activities and events. A baseline of $1,400 a month is reasonable for a nice life in many desirable areas of the country. And while all this research gives a good baseline of vibes for each place and possible costs, I can’t tell you how much I recommend that you plan a trip to Costa Rica so you can do your research in person. If you have the time, consider spending your 90-day tourist visa as a research trip. You could move to the city with the most potential for the three months, or spend a few weeks in your top three spots. Costa Rica Chica: Retiring Early, Simplifying My Life, and Realizing Less in Best: A book about a couple who sold everything to move to Costa Rica in their early 40s. The Costa Rica Escape Manual: The fourth book written by an expat who has lived in Costa Rica for three years, this book is filled with advice on how to move to Costa Rica, as well what to expect when you get there. Living in Guatemala: This eguide shares the cost of living and what it’s like in one of my favorite spots in Central America, Guatemala. Although less developed than Costa Rica, there are some very compelling reasons (great culture and more affordable, to name two) to consider moving to Guate. The Ultimate Guide to Playas del Coco: A helpful guide on travelling to Coco, this is a good resources for visitors, and expats looking for the right community. Packing for Your Move to Costa Rica: A handy advice post by expats who have been living in Costa Rica for a few years. Six Reasons I Decided Not to Move to Costa Rica: Valen weighed Costa Rica against Mexico and decided to become an expat in Mexico. Consider a good travel insurance policy like World Nomads (I’ve used them since 2008, full review here) to cover you while you’re either in transit visiting your future homes, or their insurance policies can work well as long-term expat insurance too. Planning a Research Trip to Costa Rica? I highly recommend that you take a research trip to Costa Rica before you decide to go through the process of moving your life there. Tourist visas are issued on arrival in Costa Rica, but you must have proof of an onward ticket or you cannot board the plane. Pick out a good travel insurance policy like World Nomads (I’ve used them since 2008) to cover you while you’re either in transit visiting your future homes, or their insurance policies can work well as long-term expat insurance too. If you’re visiting San José, I recommend Hostel Bekuo San Jose as a super budget option, or Auténtico Hotel for mid-range prices and accessibility to the places you’ll likely need to research. If you’re visiting Coco, it’s a small city so you can’t go wrong with most of the central places. I recommend M&M Garden House as a super budget option or Hotel La Puerta del Sol for mid-range prices and good accessibility. In Tamarindo, I recommend Pura Vida Mini Hostel as a for budget travelers, or Hotel Luna Llena for mid-range prices and convenience. Recommended Cultural Reading: If you’re hoping to fully immerse in the local culture, then The Ticos is a perfect primer guide filled with the country’s social and cultural history. The Costa Rica Literary Companion is intriguing as it’s a collection of 26 stories, each focusing on a different region of the country — great for expats looking to understand how the quality of life differs in each area. Still researching the right spot to live? Our Cost of Living Guides share extensive resources and expat stories or all the major spots around the world. These guides include thorough breakdowns of the culture, quality of life, vibe, and — importantly — budget breakdowns so you can better plan which spot in the world best meets your needs.